The bangs! The shorts! 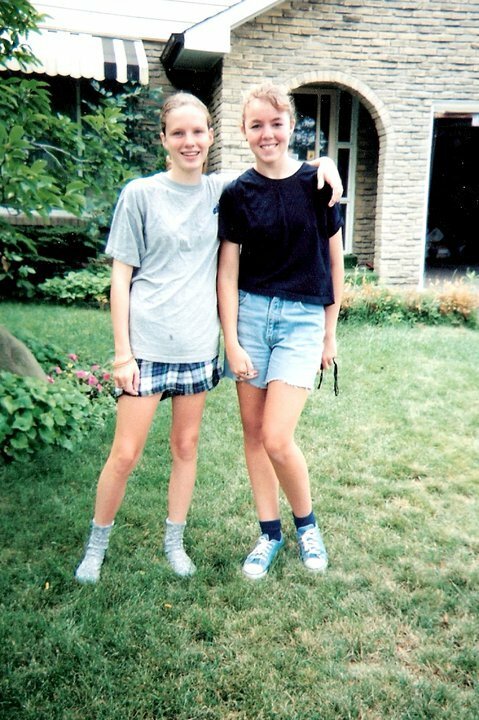 I was one hip fourteen-year-old. This is only one of the reasons I am not attending BlogPaws. I wish I could say my fashion sense has improved in the last fifteen years but that would be a lie. Today I am wearing brown cords I purchased at a sale over five years ago. My blouse is fairly new but it was also on sale which means it was probably no longer stylish by the time I bought it. My socks are actually my husband’s as I have yet to do my personal laundry after the flea-washing business. At least my hair looks good! One of the cool things about being an adult is not having to care so much about following the trends. Not that I followed them as a teenager but now I don’t get nearly as much flack from my peers for not having the latest “it” bag. It’s okay to have different priorities now. Less and less do people expect me to care about the same things as they do. Thus less and less do I find myself worrying over what to wear in the morning. It’s kind of nice. I am learning when one is an adult the word stylish can have different meanings. Stylish doesn’t even have to have anything to do with personal appearance. It can be a state of mind or a way of presenting oneself to the world. Since this is my blog, I get to decide what it means in this space. I like to think the Stylish Blogger Award represents a way of recognizing those who have done or said interesting things. Bloggers who write with authenticity and from the heart. People who take the time to appreciate others. 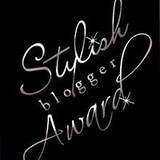 To me, the Stylish Blogger Award helps celebrate all that is fun and beautiful about the blogging world. There ain’t no one more stylish than pet bloggers. Little Dogs On Long Leashes by the hilarious and ladylike Georgia Little Pea – The prettiest “ugly” dog I have ever seen. Happy birthday week, Georgia! Success Just Clicks – Gorgeous dogs, gorgeous training skills, and a beautiful way of being present in her dogs’ life. I never go away from this blog without learning something new. Feeling Beachie – Hilary has a very funny approach to writing and life. Her stories are often based on every day life but they are definitely not ordinary. Even if I am insanely jealous she gets to spend so much time in warmer climates, I somehow find it in my heart to forgive her. Something Wagging This Way Comes – Pamela comes by this award naturally, just by having the best blog title ever. It’s hard to think of a kinder, more stylish person. I am usually stunned she even knows I exist. Paw Print City Times – Vicky earns this award for being stylish inside and out. Her blog design is gorgeous! I’d love to be able to come up with something like that one day. And her little Doodlebug is the one of the cutest puppies in the world. Love and a Six-Foot Leash – Is there anything more stylish than fostering pit-bulls? I doubt it. Though I am missing their former foster Lollie in a big way, their new foster Gonzo may just take my heart yet. As usual, I am leaving people out. Not to worry, I am currently cooking up something pretty awesome for my upcoming blogiversary. (Is that how you spell it?). So I will do my best to make it up to you very soon, I promise! Haha! I was going to demand that people acknowledge my bravery but then thought truly brave people don’t need validation. It’s appreciated, though, by this wannabe! Now I am wondering if my friend in the photo would appreciate this if she knew… Oh well! Great picture. Love the “fashion-model knee” that pushes one hip out for that sultry look that is only owned by teenage girls. Even when I have absolutely no time, I can’t resist stopping over her to see if you’ve posted anything in the morning. And today, I was astounded to find a Stylish Blogger Award and such kind words from you. So it’s time to confess my deep dark secret: reading your posts has inspired me to be a better writer and to hold less back. You write some very touching posts and I’ve admired what you’re willing to put out there. Something Wagging wouldn’t be what it is without Rescued Insanity. So thank you. Of course, you’re also reminded me that I also have a blogiversary coming up since our blogs are about the same age. Are you telling me I need to come up with something amazing? Actually, I think my blogiversary was yesterday and I forgot it. Oh no! Haha, I still remember the day this photo was taken so well. Down to every little anxiety. Mostly over my crappy bangs. Isn’t that sad? I like that I look a lot happier than I felt. Thank you so much for all of your kindess. It is so strange to me that you would say I have been an inspiration because YOU have inspired ME to be a much better blogger. Or at least, a more consistent one. So many days I feel like just not bothering. But then I will see that you have managed to write something creative and intelligent, even though you are just as busy – if not more as you write two blogs (!! ), so what is my excuse? Lately I have felt pulled in a lot of directions, I feel very far away from the Internet even though I am still here every day. It doesn’t take up as much of my thoughts as it used to. Thoughtful comments like yours and interesting posts like the ones you write go a long way to keep me going. Maybe I am not as out of the loop as I feel after all! That’s hilarious! Forgetting your blogiversary is totally something I would do. After all, I still don’t know the anniversary of when my PH and I started dating! Oops. You still have time, I am sure. And please don’t think it will be amazing. That is definitely a massive exaggeration!! Hopefully it will at least be fun. Congratulations! I think that you and Shiva deserve any and all awards anyone wants to bestow. If they include money, all the better! LOL. Wouldn’t that be nice? Then I could buy you all cookies! Wow! Congrats on your spiffy new look. It’s very advanced. I’ve been trying to navigate it for the last 10 minutes and kept getting lost and had to go back to square one I.e. MY blog and click on your link again. What a terrible way to discover how tech stupid I really am. You cannot possibly be any more “tech stupid” than I am. Puh-lease. Now I’M confused. Don’t you have anew look? I might have missed a post before this one but this site is completely new! Hello? I feel like I might be in the twilight zone. No, I really haven’t changed anything at all. What are you seeing? I really want to know. Maybe WP has screwed something up! I’d never thought of it like that before, but you’re absolutely right about adulthood freeing you from having to keep up with trends. At the worst, as long as you own what you’re wearing and throw your shoulders back proudly, who’s gonna call you out for having poofy bangs in 2011? Maybe no sense of style goes along with being a thoughtful and intelligent writer (at least I’d like to think so). I’m also wearing brown corduroy today, except mine is a very long skirt, along with a sweater a former classmate assured me would look good on her grandmother, but at least I’m wearing my own socks. Have I ever mentioned that I have completely white hair for well over a decade, and no one can understand why I refuse to dye it? As for style, I think you are incredibly stylish…. To me, style doesn’t have anything to do with the clothes you wear, or if you follow the latest trends. Anyone can do that, if they have the money and a current fashion magazine. That is just copying – following someone else’s definition of style. True style, I feel is being comfortable with yourself, regardless of if you are wearing 15 year old jeans or jeans that were just on the cover of Cosmo. And comfortable enough to show who you are. That is something that you do every day. I love reading your posts, because you always show yourself in them. I think you are beautiful inside and out. Uh, I believe those are cut off shorts, are they not? That means you DESIGNED THOSE YOURSELF, which means that not only are you stylish, but you have PERSONAL STYLE. Well, we can’t BOTH be stylish my dear sister. Ha ha ha. Besides, at that time I remember I was sporting florescent pink sweaters with geometric shapes. I was not a fashionable child. Lol. Second, I SO agree with Pamela. I totally feel like your honesty, and thoughtful posts, have made me want to be a better blogger. I love reading your posts. I honestly don’t know how you do it. I can barely keep up with mine these days and yet here you are, working, training Shiva and writing some of the most wonderful and engaging posts. Care to share how you do it? Finally, thank you. I really don’t deserve the award, or your kinds words. I tend to be somewhat sporadic in my posts and commenting on other’s blogs (based on how busy I am) and I tend to be a bit soap-boxey at times. But, I really do appreciate the award. You made my day! Oh. And you can call me “gal” anytime! LOL! I have so many pictures where I look the same! hehe.